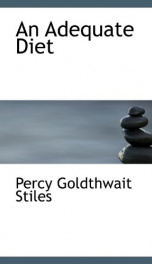 Read online "an adequate diet" by percy goldthwait stiles. Instant free e-book download at OnRead.com. This book is not available for reading. If You are a copyright holder and want to give this book to read, please contact us. If You are believe that this book came out of copyright, and you want to read it on this site, please contact us. The site is set up for educational purposes. We respect copyright and give users the opportunity to get to know the world literature and communicate also. More details about us.